Virginia Gov. 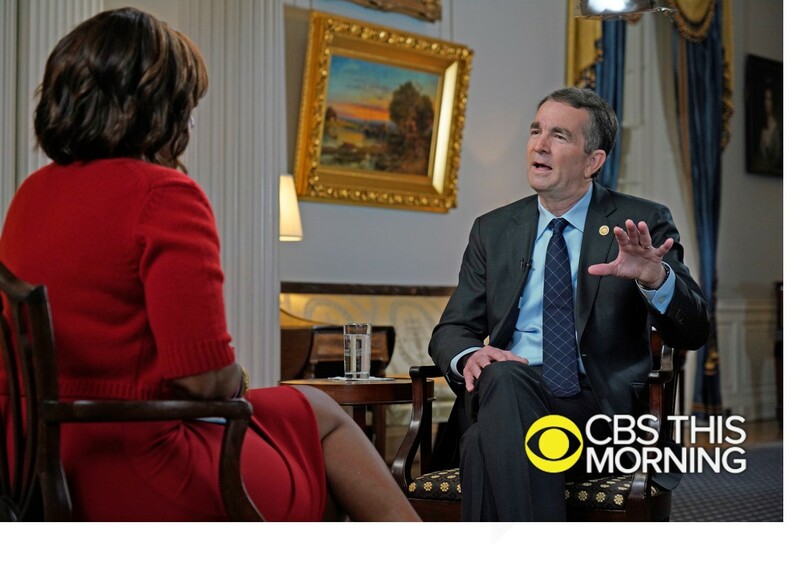 Ralph Northam sat down with CBS THIS MORNING co-host Gayle King for his first televised interview since his controversial yearbook photo surfaced last week. The extended interview was broadcast in two parts on CBS THIS MORNING today. Link to interview and transcript are below. GAYLE KING: What have you learned that you didn’t know before? NORTHAM: I knew I was, Ms. King, but I didn’t realize really the powerful implications of that. And again talking to a lot of friends, that has come crystal clear to me this week. I have also learned why the use of blackface is so offensive, and yes, I knew it in the past. But reality has really set in. KING: But Governor, it’s hard for people listening to you, an educated man, at the age of 59, to say that you’re just learning about the history of it. You didn’t know the history, know that it was offensive before? NORTHAM: I think we’re all on a learning curve, and certainly, Ms. King, I am not the same person now at age 59 that I was back in my early 20s. KING: But your early 20s were – was 1984, not 1964. KING: So you would think in 1984 that this was certainly a problem back then. NORTHAM: I don’t think there’s any question that there are today and there were then, when I was in my early 20s, racial insensitivities. I think there still were unconscious attitudes that yes, we are aware of these things, but we don’t realize sometimes, especially as a white person, how impactful, how offensive they are. And again, I’ve still got a lot to learn, but this has been a week that has been very eye-opening for me. KING: Mm hm. Did you have black friends growing up? NORTHAM: I did. I grew up on the eastern shore in a very rural area. When I was in the fifth grade, schools were desegregated. So from the sixth grade through the 12th grade I was in integrated schools, and yes, so I – I grew up in that environment. KING: See, that’s what makes it even harder for us to understand. You had black friends or grew up with black people. So it would seem that you would be more sensitive and more aware of that. NORTHAM: I don’t have any excuses for what I did in my early life, but I can just tell you that I have learned. I have a lot more to learn. I’m a better person, and here as I sit as a 59-year-old man governing the Commonwealth of Virginia, this is really an opportunity, I believe, to make awareness of this issue, to really have a frank dialogue and discussion about race and equity in this country. KING: Let’s go back to the picture, and I know you’ve addressed it, but it still raises so many questions for people. KING: Why do you think it came out now? KING: How can that be? It’s on your yearbook page, Governor. NORTHAM: Well, I was shocked to- to see it. And I really believe that the fact that, if you look at the unpreparedness of me to react to this, both on Friday night and Saturday, that really confirms that this is the first time. KING: Well, let me ask you this. Are those your pants? Those pants are very distinct. Do you have a pair of pants that look like that? NORTHAM: I have never had any pants like that. KING: You first said that it was – well, first you said you wouldn’t say which one was you. That was the first thing, and then you said – then you came and apologize for being in the picture. Why would you apologize for something that horrific if you’re not 100 percent sure that it’s you? KING: But why did you do that? NORTHAM: Well, when you’re in a state of shock like I was, we don’t always think as clearly as we should. I will tell you that later that night I had a chance to step back, take a deep breath, look at the picture and said, “This is not me in the picture.” And I also had a number of friends and classmates from medical school that called and said, Ralph, that is not true, and that was comforting as well for them. KING: But Governor, that’s a hell of an overreaction for something that is so sensitive and so offensive and so explosive to take responsibility without really knowing for 100 percent that that’s me. NORTHAM: Yes, again when I, when I stepped back and looked at it, I just said I know it’s not me in the Klan outfit. And I started looking in the picture of the individual with blackface. I said, that’s not me either. And that’s why I felt so strongly about going in front of the camera on Saturday and clarifying this. KING: For many of us watching, it looks like you were about to actually demonstrate the moonwalk. Were you thinking about showing off your moonwalking skills? NORTHAM: No, because I don’t have those at age 59, but I will tell you again I regret that this is a serious moment. KING: Yes, it’s very serious. NORTHAM: And whether it was a nervous laugh or whatever, it was inappropriate. KING: So you weren’t thinking about doing it, when you looked over at that the floor, you were not thinking about doing a moonwalk. KING: Many people credit Pam. Pam, your lovely wife, for stepping in. KING: Another reason to be nicer on Valentine’s Day for you, sir. NORTHAM: Gayle, let me just tell you that, as we say, I married way up, and I would not be sitting here having this conversation if it wasn’t for my wife of 33 years. KING: What do you say to people that are looking at this story, if you do stay in office, which you say you are, to someone that commits a racist offense and says, “Well, the governor did it. And he – and he’s okay”? Do you think it sends a message that this isn’t being taken seriously, if you stay in office, when so many people, at the highest levels, want you to step down? NORTHAM: You know, I’m not here to make any excuses. But I will tell you that the man that you’re looking at right now ­ at age 59, who has given ­ over 35 years of service to the United States Army, I have taken care of thousands of sick children and have had over 12 years of public service to the Commonwealth of Virginia, the man you’re looking at and talking to right now is not who I was in my early 20s. I have learned. I admit to my mistakes. And I’m going to improve my life and do better and be in a position where I can help other people. That’s why I do what I do, Gayle – every morning I get up. If I feel like I’m helping people, then that makes me content. GAYLE KING: I’m marveling that you are still standing when so many people have said you’ve got to go and you’ve got to go now. I’m thinking he’s either got a lot of confidence or he’s just a little crazy. GOV. RALPH NORTHAM: Well, I know in my heart who I am, and I know what I can do, and Virginia, right now, needs a leader that’s strong, that has courage and that can take us to the next level, and I can do that. KING: You might have to convince people that you are still the right leader for this job. You have a lot to do. NORTHAM: I have a lot of work to do. But I will do everything I can to regain Virginia’s trust. NORTHAM: Saturday was a very busy day. I did talk to my wife, my close colleagues. And I just made the decision that we need to clarify this. KING: But was there some concern with people saying, “Governor, now, you’re going to really look crazy”? NORTHAM: Well, I’ve always been a transparent person. And I just thought it was important to let people know that that wasn’t me. That’s not who I was at that time. And it’s certainly not who I am now, after 35 years of service to this country and my commonwealth. KING: – about “He needs to go. He needs to go,” by people in your own party, but some of the top democratic leaders in the country – by some of your constituents, who were protesting outside your home. And after that happened, you thought what? NORTHAM: I thought, first of all, “I have hurt a lot of people, and not only in Virginia, but in this country.” But also know that I was elected to be the governor of Virginia. People had faith and confidence in me. And we’ve had a great first year. KING: – and why you think you still deserve this job, when so many people are calling for you to step down. NORTHAM: Well, again, we have worked very hard. Right now, Virginia needs someone that can heal. Virginia also needs someone who is strong, who has empathy, who has courage, and who has a moral compass. And that’s why I’m not going anywhere. KING: You know, the other thing that struck people in the news conference is when you were talking about Michael Jackson. And you said, you know, “Because many people know it’s hard to remove shoe polish from your face.” And I’m thinking – how do you know that? KING: Because it implies that you’ve certainly put shoe polish on your face on more than one occasion. How do you know that it’s difficult to remove? KING: I didn’t know that. KING: My dad used to do that. NORTHAM: Yes. And the shoe polish goes through that cloth. And it gets on your finger – or my finger. And it’s very difficult to remove. So that’s why I know shoe polish is difficult to remove. KING: So that’s what you were referring to. KING: From the very beginning, you said you were not stepping down. But the story has certainly changed. Are there any circumstances that you would step down? KING: Wouldn’t you have preferred to have this unique opportunity another way? NORTHAM: Again, I really do believe that things happen for a reason. KING: And what do you think that reason is? NORTHAM: That we are in a position to learn. I will focus on race and equity. That’s something that, for the next three years, is going to be my commitment to Virginia. And I really think we can make impactful changes.